I look back fondly on an old teacher of mine. The most influential thing he said to me was after we had an argument about strength and females. I was 15 at the time, I said men were stronger than women. He said he knew women who were stronger than him. I said if we lined up every man and every woman– if we paired the strongest man to the strongest woman- down the line- each man would be stronger. He said- you don't know as much as you think you know. It's funny- because I was an obstinate youth and my statement was within reason- but he still managed to sting me enough positively in a place that guided me intellectually. I guess he was like a Jedi in that way. It made me question what I know. It made me question the limits of my knowledge– and of my certainty. I believed I could know things– but how? I was always fascinated by extraordinary popular delusions and the madness of crowds. As people, our susceptibility to fads and superstitions always amazed me. It may seem more obvious from our perspective that the infamous Salem witch trials were a major malfunction in human reason, but at the time they occurred it wasn't so clear. That's because many of our beliefs operate beneath the surface and are deeply imbedded in our thoughts, programmed by our culture without us even being aware of their influence on us and our persons. Michael Shermer's book The Believing Brain taught me that people mostly believe what they want to believe, and that they reinforce their beliefs as they age. That was really interesting to me. Essentially if one believes in objective truth, and if one is interested in being right, Shermer's solution is to be a skeptic of the world and of oneself. As a species we should be responsibly aware of our fallibility, especially if we want to facilitate environments that maximize progress and wellbeing. If one wants to be good regarding personal development, one needs the ability to detect one's own blind spots to self-correct; one can not be afraid to be wrong and make mistakes. I believe people should engage more in deep conversation. A lot of people say they don't like to argue, so that's why they stay away from hot topics and I understand that. Arguments can leave people feeling tense, frustrated, insecure, uncertain, unresolved, vulnerable, antagonized, attacked, and angry. Part of the problem with arguments is that they don't depend on truth. One doesn't need to be right to win an argument. Arguments more primarily depend on undermining one's opponent and proving him "wrong." This is how it is possible for a Holocaust denier like David Irving to ever win a debate; he'll latch onto a historical inaccuracy told by his opponent to seemingly discredit all else his opponent says. Another part of the problem with arguments has to do with our perception of arguments as war with winners and losers. Instead we should approach good arguments as a form of collaboration, where people aim to reach consensus for cognitive gain. •RULE 2: “Never go outside the expertise of your people.” It results in confusion, fear and retreat. Feeling secure adds to the backbone of anyone. •RULE 3: “Whenever possible, go outside the expertise of the enemy.” Look for ways to increase insecurity, anxiety and uncertainty. •RULE 4: “Make the enemy live up to its own book of rules.” If the rule is that every letter gets a reply, send 30,000 letters. You can kill them with this because no one can possibly obey all of their own rules. •RULE 5: “Ridicule is man’s most potent weapon.” There is no defense. It’s irrational. It’s infuriating. It also works as a key pressure point to force the enemy into concessions. •RULE 12: “Pick the target, freeze it, personalize it, and polarize it.” Cut off the support network and isolate the target from sympathy. Go after people and not institutions; people hurt faster than institutions. This is a very popular political science text, and informative on a lot of political behavior– it is easy to see Alinksy tactics used all the time, especially in the media. We live in a climate that is an increasingly more superficial sound-byte culture. We don't care about arguments, we care about our perceptions of authority figures. If someone is religious or atheist, nice or mean, Mormon, Protestant, Scientologist, Muslim, Democrat, Republican– where they went to school, if they cheated on their spouse, their good habits, their bad habits– anything to provide shortcuts to judge credibility without having necessary deep discussions on core issues and premises. This creates a rhetoric over argument phenomenon. We don't focus on issues, or weigh information– we focus on the deliverers of information– and how it is delivered and framed by others around us. This largely depends on the high price of information. It is timely expensive to fully expose oneself to arguments and information– and many people aren't interested in investing their valuable time to read source texts. They will read someone else's summary of the source text, as if it is a viable substitute. What can possibly be done about this? 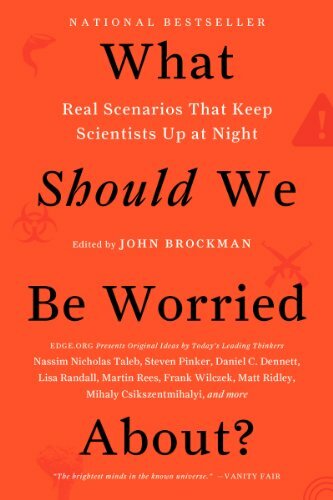 I don't have an answer for right now– but I am reminded of an excerpt from an essay by Bruce Parker in the book What Should We Be Worried About, curated by John Brockman of Edge.org. The internet (and its associated media/communication entities, especially cell phones and cable TV) empower [pop culture]. And that culture is no longer concerned only with pop music, movies, TV, and video games. It now includes religion and politics and almost everything that touches people in everyday life. It is a bottom-up "culture" with a dumbing-down effect that is likely to have repercussions... It promotes emotion over logic, self-centeredness over open-mindedness, and entertainment value and money-making ability over truth and understanding. And for the most part it ignores science. For one thing, it is time for pop-culture to stop dumbing things down! It is creating a very negative feed-back loop that is numbing audiences and wringing them of wonderment and interest. I agree that people need to take a falibilistic scientific approach to things. My dream is that the internet and technology will continue to lower the price of information, making it easier for people to make sense of it all. For example, imagine a world where we wear Google Glasses that have built-in fact checker apps that tag key words, phrases, names, and dates– storing information in real-time for later review, while also checking information with online sources to help one provisionally assess what one is hearing live. For example, if someone said "Humans lived at the same time as dinosaurs," a subtitled quote with a red "X" next to it could indicate the misinformation. We are far away from that– but not as far as you might think. I believe it is important to judge and to prepare to be judged. I look at everyone just as skeptically, but that means I strive to recognize good information no matter where it comes from. I am an atheist (technically agnostic), but that doesn't mean I can't derive wisdom or valuable information and insight from someone of religious faith. I think Scientology is an absurd cult, but I might be one of the only people in the world who actually enjoyed watching After Earth. The only reason was I loved the message: "fear is a choice, danger is real." The monologue in the film where Will Smith talks about the day he chose to no longer be afraid, felt like he was incepting wisdom into my brain. Conversations can be very hard to have when you are dealing with a conflict of visions. This is made exceedingly difficult by the fact that many people listen to respond, and not to understand. People on both sides of any discussion usually work with different pieces of information, cite different sources, and cherry pick facts in convenient (or inconvenient, depending on your perspective) ways to steer conversations and keep them in familiar territory. After all, people have a tendency to fear the unknown. It's true the better I get at arguments, the more I lose. Some people have trouble conceding points to their opponents. If my opponent says something that I don't know– it doesn't cause me fear or discomfort. I have no problem asking my opponent to elaborate and clarify. I have no problem being skeptical of new information, while allowing my opponent the benefit of the doubt so he can make his points. I can always verify the information later– and continue the discussion at another time. In fact, the best case scenario is I might learn something. That is why I like to engage in hard conversations. I think part of progress is how humans strive for better explanations for things. We are limited by our language, and speech. We have to translate our ideas into words. And it also matters less what we mean to say, and matters more what people hear. Or what they interpret. To communicate well, one needs a good theory of mind. We must understand the perspectives of the people we are speaking with, if we want to be able to communicate with them most clearly. Science is a limited but self-correcting tool we create born from our minds to order our sense of the physical world. Science is the best tool we can use to navigate uncertainty. I am certain that I am uncertain. I am certain that I exist. I am certain that I think. From there, I must take certain leaps of faith when making my decisions. For example- I adhere to facts, but there is also a half-life to certain facts- it also takes a good understanding of what a fact is- and it requires a good exposure to information on all sides- which a lot of people struggle to do. A lot of people create echo-chambers around themselves. These people can be hard to reach (and it can be hard for them to reach others), but I like to think there is wisdom to be found everywhere, from allies and opponents. I need to be able to weigh information. Most people are more likely to take bad advice from a good friend than good advice from a perceived opponent (I want to be the opposite type of person). That's because I am attracted to truth. I believe people are attracted to truth, because as Keats would say "truth is beauty."